For this week’s fabulous video I’m featuring a glamorous hair tutorial inspired by Lyn Barri in Sunset Valley Serenade. This is a 1940’s inspired look with two victory rolls, and a style I call the infinity roll as the shape it creates is like the infinity symbol. Let me know if you love this look by commenting below, and if you have a tutorial you’d like to see please also comment below. To stay up to date with all my vintage fun be sure to subscribe to my YouTube channel and I’ll see you in my next video! 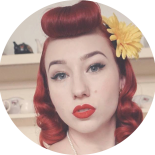 This entry was posted on June 14, 2018 by Miss Lady Lace in Pinup, tutorial, Videos, YouTube and tagged 1940's, 1940's hair, 1950's, blogger, glamour, hair tutorial, miss lady lace, miss lady laces pinup blog, perth, perth pinup, perth pinup blog, perth pinup community, pin up, pinup, pinup blog, pinup blogger, pinup fashion, pinup girl, pinup hair, pinup life, pinup lifestyle, pinup perth, red lips, retro blog, retro girl, retro glamour, the perth pinup community, victory rolls, vintage, vintage blog, vintage blogger, vintage fashion, vintage girl, vintage glamour, vintage perth, vintage pinup blog.